Do you know how 'Suhaagans' remain beautiful? They accept peacefully and they speak sweetly! Last week my maternal grandmother, Preetam Kaur, passed away, only a few months after my grandfather. Twice an immigrant, first from Pakistan to India, and then India to the US, this pink complexioned Pindi lady was full of love just like her name suggested. Gurbani was always on her lips and deep in her heart. She was dyed in Sehaj and Santokh in a way I have rarely seen anyone else. You could have known her for ages or just met her, but you could not have met her without being charmed by her smile and overwhelmed by her hospitality. There was one quality that everyone who met her remembers her with - her sweet words. The sweetness of the Nirvair universe had somehow condensed into her. No one ever heard anything harsh from her about anyone. Whether they were present or not. She would always look at the positive side of every everyone and every instance. We met her the day before she left and she was in tremendous pain, she could not speak, but she smiled when she saw Geet, my eighteen month old daughter. I usually sing Gauri at the occasion of death. This weekened, one person at her funeral mentioned that a soul like her descends to earth once in a generation. I thought it was apt to sing Raag Suhi in this case. 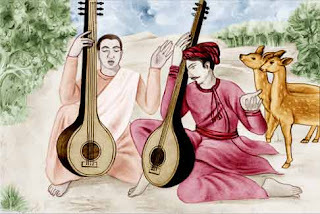 Raag Suhi is named after the color "Suhaa" or red. The word has a common origin with "Suhaag" which connotes the bliss of a bride that is in love. Red is also the universal the color of love. This is the raag we sing when someone gets married. The laavan are sung in this raag. It would only be apt to sing Raag Suhi to remember this pink complexioned lady imbued in love. I feel sorry to hear the news about grandma's passing away Shiv. I've seen this photo earlier and loved it as it gives much pleasure to see a photo with the sweetness of grandma's look. My deepest heartfelt sympathy to all at home in regard to grandma's passing away.